The hand of the artist is attached to a mouse, connected to a computer. The machine is the studio. The software becomes the paintbrush, the chisel, the camera: the digital file (.JPG, .GIF, .MOV, .MP3) the artwork. Since the late 1970's, computer-mediated artwork has been produced in this manner. QR/ART is a digital exhibition curated by artist Krystal South for the Shine a Light event at the Portland Art Museum, taking place on October 14, 2011. 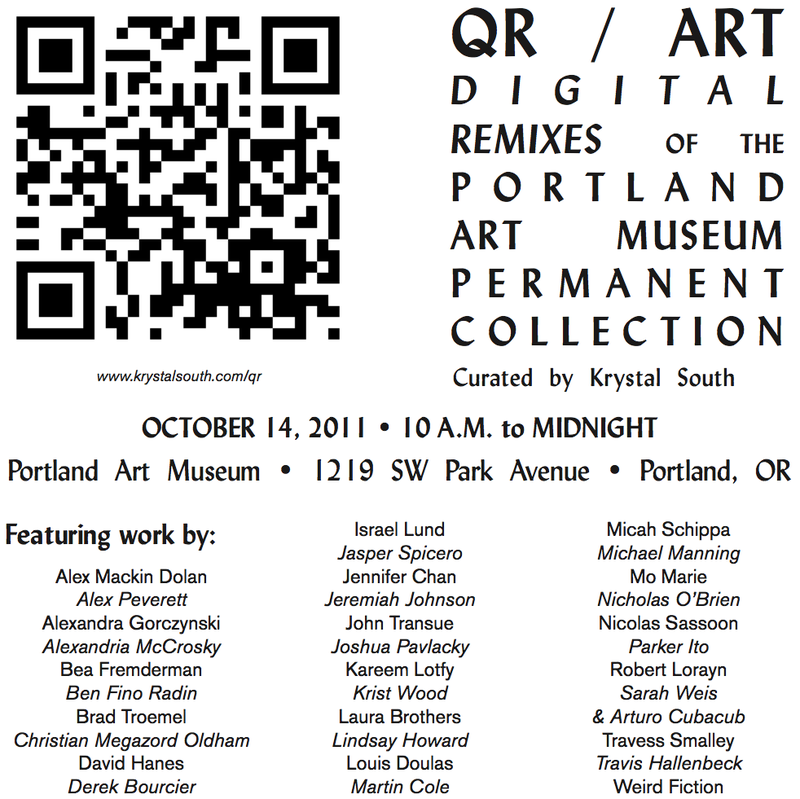 Posed as a response to the lack of new media and internet-based artworks in the collection of the Portland Art Museum, the works presented through QR codes eliminate the need for a physical exhibition space and allow digitally-created works to remain within the digital realm. The exhibition includes works from thirty-three artists working with various digital media. Each artist was asked to look through the online archive of the PAM collection, and select a singular artwork to remix or respond in the digital manner of their choice. The elected artworks range in age from 200 BCE to 2002 - covering forms from a Native American Transformation Mask to 17th century French oil painting to modern sculpture. These artists have provided their post-Internet aware contemporary perspective to works of a very diverse nature. Their remixes and responses are constructed of an equally wide range of new media, from appropriated videos and original music compositions to 3D models and animated GIF's. This call and response between making and meaning extends both works. QR codes, read with smartphones, are implemented for distribution of QR/ART in order to bring the work into the palm or pocket of the viewer; creating a portable/personal art experience while in the presence of the original work of art and beyond. The archetype is edified in the digital aura, reshaping a potential future for art viewership. "This annual event reshapes the Museum experience through installations, performances, and presentations throughout the campus. Innovative activities push the conventional boundaries of art. After a light schedule of activities during the day, the event really takes off at night with special performances, installations, tours, workshops, and games all over the Museum. This year, Museum-goers will have the opportunity to get a hair cut in the style of their favorite Museum artwork; pick up art-inspired recipes by popular Portland chefs; make their own Museum postcards; engage in beer/art conversations; get a tattoo inspired by artwork in the collection; enjoy food inspired by the Museum; find dance in unexpected places; square dance the night away; and much more. Shine a Light offers an exciting opportunity to reinvigorate your relationship with art by engaging with the Museum in unexpected ways and to join the community at large in celebrating art."